Chief of health care reform Lawrence Miller and director of health care reform Robin Lunge, center, watch as Gov. Peter Shumlin speaks. Two months before he leaves office, Gov. Peter Shumlin appointed his longtime health care reform director to a six-year term on the state panel that regulates Vermont’s health industry. Robin Lunge will join the five-member Green Mountain Care Board on November 28, Shumlin’s office announced Wednesday. She will replace Dr. Allen Ramsay, whose term on the board expired September 30. Lunge has worked in the Shumlin administration since he took office in 2011. 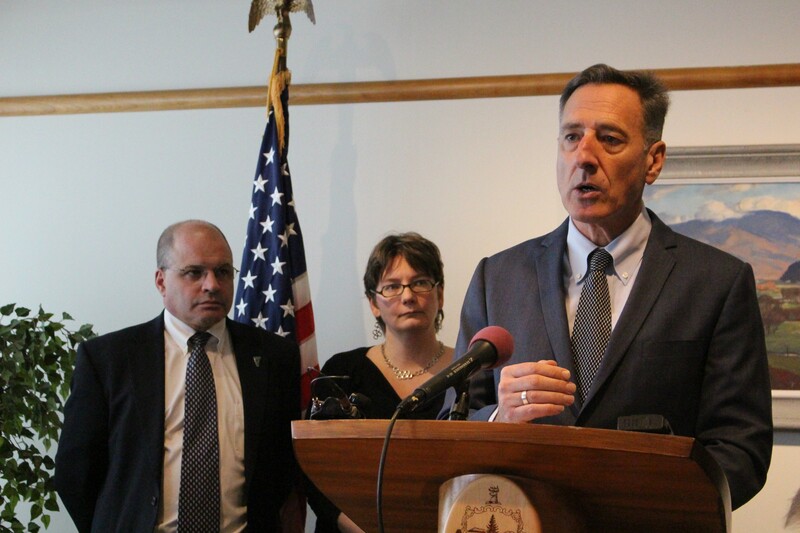 During that time, the governor tried unsuccessfully to create a universal health care system, launched the Vermont Health Connect insurance exchange and negotiated an all-payer waiver with the federal government touted as a way to reform health care spending. Before joining the Shumlin administration, Lunge was a health care specialist for the legislative counsel that serves the state legislature. She holds a law degree from Cornell University and a master’s in health care delivery from Dartmouth College. The Green Mountain Care Board position is a full-time job. In 2016, members were paid $93,226 a year. Lunge’s salary as health care reform director was $100,963.